Rayalaseema University Faculty recruitment: Rayalaseema University, Kurnool has given Subject wise Assistant Professors recruitment notification and RU invites applications for the recruitment of Professor vacancies in the following departments. Online Applications are invited for the posts of Assistant Professor in the following departments. For the Registration, Submission of Online Application with eligibility criteria, Research, Experience, Registration fee and other details, please visit the website http://www.sche.ap.gov.in/ASSTPROF/Masters/Home.aspx, go through linked with University website www.ruk.ac.in. Filled in online application along with acknowledgement of Registration fee, should downloaded and submit the same to The Registrar, Rayalaseema University Kurnool–518007 on or before 19-01-2018 by 05:00 PM. Roster Points for the following teaching posts (Assistant Professor) sanctioned by the government of AP Dept. of Higher Education (UE) vide G.O. MS. 33, dated 30.06.2017.
http://www.sche.ap.gov.in/ASSTPROF/Masters/Home.aspx, go through linked with University website www.ruk.ac.in. Filled in online application along with acknowledgement of Registration fee, should downloaded and submit the same to The Registrar, Rayalaseema University Kurnool–518007 on or before 19.01.2018 by 05:00 PM. Rayalaseema University Assistant Professor Posts Recruitment, Applying Last date: 19.01.2018. 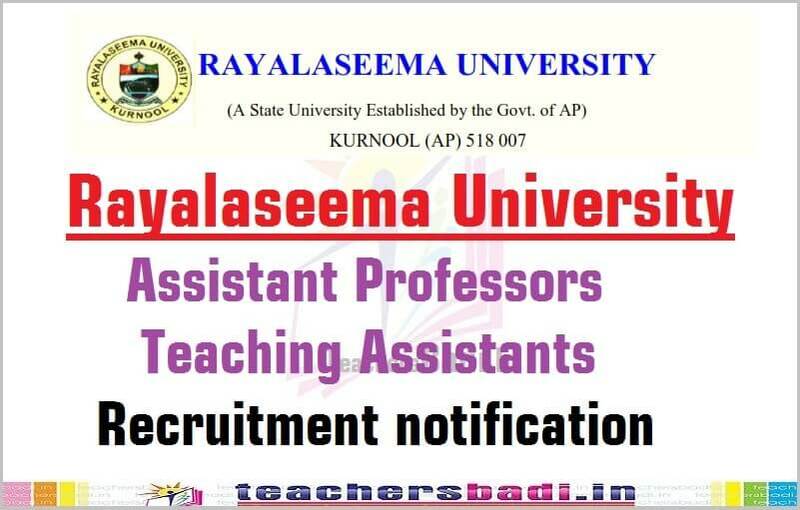 Rayalaseema University, Kurnool invites online applications for the posts of Assistant Professor in the Department of Teulug and Department of Physics.